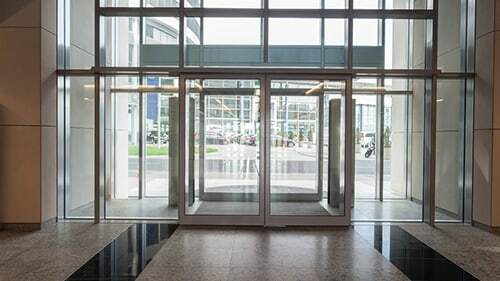 Automatic doors provide convenient and easy access to millions of people entering and exiting busy office buildings, stores, airports and more, but it is easy to be oblivious of the powerful machinery and technology that comprise these doors. The Chicago automatic door accident attorneys of Rosenfeld Injury Lawyers LLC protect the rights of anyone who has been injured because property owners or managers failed to provide safe environments for all of the people who have the right to be on their property. When automatic doors malfunction and cause harm to others, it is the responsibility of property managers or owners to provide compensation to those who have been harmed so that they may recover from their injuries without undue financial consequences. Everywhere we turn it seems, we run through an automatic door. Most of us take for granted the fact that doors will open as we approach them in modern society and may be more inclined to notice the lack of an automatic door than to acknowledge its presence. There are different forms of automatic doors which use different types of sensors and machinery to either swing or slide open and malfunctioning parts or sensors are the most common causes of automatic door related injuries. The types of injuries sustained are relative to the severity of the malfunction and the type of the door responsible for the injury. Here are the most common types of injuries our Chicago premises liability lawyers encounter on a regular basis. Pinch point accidents. Since many automatic doors slide open and closed, it is not uncommon for victims to suffer injuries when their hand, foot or another limb gets caught between moving parts. The point where the moving parts intersect with the body part is referred to as a pinch point. Blunt force injuries. Doors that swing in the wrong direction, fail to open when they are supposed to, or close prematurely can cause blunt force trauma to those who are hit with the door or walk into it on accident. Lacerations. If a door strikes a person hard enough for the glass to break, it can cause deep lacerations that require immediate medical attention. Being crushed from overhead. This is common in garages with automatic garage doors and may result in serious injury to the head, neck or brain if the door crushes the victim from above. It is the responsibility of property owners to make sure that their properties are safe for anyone that is invited onto or allowed entry onto the property. In order to ensure that all automatic doors are operating safely, they must perform routine inspections and repairs. Once the doors are installed, they should undergo an initial inspection to make sure the installation was handled properly, the parts are in working order and the sensors are working as intended. Future inspections can reveal the need to repair or replace parts that have broken due to wear and tear. If someone who has been invited onto the property— such as a resident or a customer— is injured while on the premises, the property owner may be held liable for the cost of the victim’s medical treatment, out of pocket expenses, lost financial opportunities and pain and suffering. Rosenfeld Injury Lawyers LLC is an award winning personal injury law firm that has recovered compensation on behalf of thousands of clients who endured injuries because negligent property owners failed to provide a safe environment to their visitors. If you have been injured in an accident with an automatic door, contact us today to speak with a Chicago premises liability attorney to learn more about your legal options and how we can ensure the greatest chance of a successful financial recovery. If we are unable to recover damages on your behalf, our services will be free of charge.